These were discovered when the Big Y results of two of Benjamin's descendants, one each through sons Joseph and Daniel, were compared. Because the testers match one another for them, and no one else, they could only have come from Benjamin, their mutual ancestor. In other words, mutual ancestor, mutual SNPs. I've lately been dividing CF02 into subgroups largely according to advanced SNP testing. Because the new tester is found to have a genetic configuration presently unknown to the rest of the group, I've created CF02/D. Testers found to have the same SNPs, will go into that group. As our testing moves forward, the groupings will continue to remain fluid. It is one of my goals for CF02 to see it well-parsed into definable families, at least DNA-wise. Of course, should we discover the MRCA for all CF02ers, the results may again be pulled into a single, newly-defined CF02. Mutations are, by their very nature and definition, random. It's said that, on average, each of us are born with sixty, and that's among 3.1 billion bases. How often does one of those hit the Y chromosome? Rarely. Still, by looking across its database, YFull presently estimates that the average Y-SNP mutation rate is 144.41 years. If we accept that, then the two SNPs in question could have emerged anytime prior to 288.82 years before Benjamin's birth, between c1327-c1615. That doesn't tell us a great deal. As far as SNP mutation goes, anything could have happened. For example, I have four private (unmatched) SNPs that emerged in my line some time from the birth of Edward Cooley (1763-1822), a son of John Cooley of Stokes County, North Carolina, to my birth in 1950, about 187 years. That's an average of one Y-SNP mutation every 47 years, far faster than expected. On the other hand, the two Benjamin Big Y testers have only one test-worthy SNP among them, and that's spanning a period of about 335 years. Indeed, Benjamin himself might have been born with both mutations. As I have often said regarding genealogy, we won't know until we know. But make no mistake about it, genetic genealogy has dramatically redefined the knowable. Still, these results are encouraging. Even the most conservative prediction brings the new Cooley MRCA (Most Recent Common Ancestor) into the age of English surname acquisition. He was indeed a Cooley, as is attested by the tester's own surname. It's clear that there's nothing to be gained from more testing among Benjamin's known descendants. For the others, I'd recommend either the R1b-A11786 CF02 Cooley Segregation Panel or a reduced version of it. For example, we know that all 17 SNPs other than A12022 and A12024 came into Benjamin's lineage well before his own birth. Testers not having them will go into the new CF02/D group. Those who have them will have an increased likelihood of being descended from Benjamin. And then there may be testers who will yet have a different combination of the 17. That depends on how many Cooley immigrants from the Tring area there were. Obviously, that's a specific, finite number. The two highlighted SNPs are the essential ones. A tester who lacks one or both can be said not to have descended from Benjamin. Anyone who matches all six might wish to do further testing since a match of six SNPs means only that you're likely more closely related to Benjamin than those who mismatch by even one SNP. Still, there are 11 more SNPs. (As far as I'm concerned, a partial match is a good thing rather than a bad one, for it better develops the tree, as has happened with this latest test.) In any case, keep in mind that the above list will likely be modified as more test results come in. Eventually, non-Cooleys will be found to match a smaller set of the 17 SNPs, just as the Brown tester (whose ancestor might have lived more than 2,000 years ago) matched only five of the previous larger block. When these are found, we can snip those SNPs from the essential Cooley block. In the end, we will likely be dealing with only about 5 of the 17, the others belonging to older non-Cooley lineages. Although the six-SNP test is recommended to anyone not having proved descent from Benjamin, I'd personally like to see tests from kit #323365, possibly descended from Benjamin's contemporary, Samuell Coley, and from either #270772 or #267595, descendants of brothers Abraham (-c1820) and Thaddeus (-1814) of Virgina. Still, the SNP discovery potential of the Big Y remains the gold standard — and I certainly wouldn't dissuade anyone from taking it — but we now have a large number of pre-1615 SNPs that provide a worthy alternative. One more point about SNPs, one that should help clear up potential confusion about SNP and haplogroup naming. For the most part, SNP blocks are named for one of the SNPs in the block, often the one found to be at the top of an alphanumeric listing. Yet different companies often choose different SNPs to designate as block name. A haplogroup, merely a block that is parent to downstream (descendant) blocks, is prefixed with a letter or short alphanumeric string, R, E, or R1b, for example. CF02 is part of the R-Y15926 (or R1b-Y15926) haplogroup, which is FTDNA's designation for what is now a small set of SNPs. However, YFull, an important player in Big Y processing and SNP naming, has named the R-Y15926 haplogroup for another of the seven SNPs in the same block: R-Y15647. But YFull is not yet aware of the Cooley/Brown haplogroup — simply for reason that the Brown tester is not in their database. Therefore, Cooley/Brown and "the seventeen" are lumped together in one block on the YFull tree as R-A11637, a block that we've now broken into three parts: R-A11639, R-A12020, and R-A12022. (I choose not to put the haplogroup designations in these graphics.) There's also confusion due to the fact that one SNP can have two or more names. Not long after the second CF02 Big Y was completed, I sent the Cooley/Brown SNPs to yseq for evaluation and naming. This was long before YFull completed their work. Therefore, the yseq names (beginning with an A) stuck. However, I sent "the seventeen" to yseq just as YFull happened to be completing their work. Therefore, it's YFull's names (starting with Y) that show up on their tree. Finally, STRs (as found in the Cooley DNA Project results page) are great for arranging testers into generalized groups. For CF02, there's a limit to how well that works. We can no longer assume that all CF02'ers descend from Benjamin. As I've often stated, the problem with STRs is that they're prone to further mutation, and will even move back and forth between values over the generations. One can rely only on the trend of many STR markers, not on them individually. Occasionally, however, an STR comes along that is fairly predictive. This appears to be the case with DYS464 in the CF01 project. 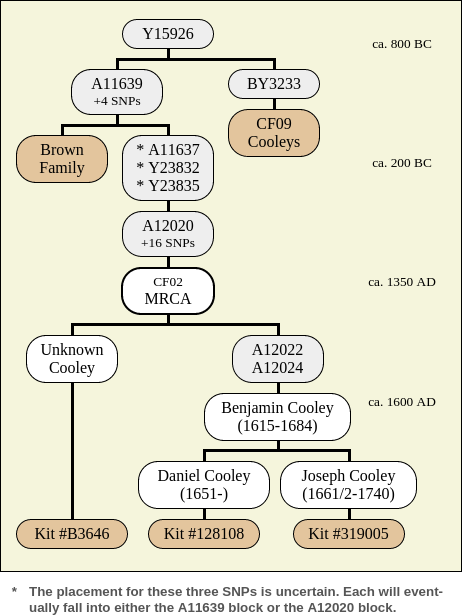 All CF01 Cooleys having 13 repeats are known descendants of John Cooley. Those with 15 repeats are almost certainly of a collateral line. So far, nothing like this has presented itself among CF02 testers. Another big product of the Big Y is that it also examines nearly 500 STRs. I've yet had a good opportunity to study those STRs — there are too few results at present with which to make a meaningful analysis. In time, though, we may once again come to rely on STRs to carry to work forward. But more about CF02 and STRs in a future article. 1For the new SNP tester, we have only surname, Y-DNA signature, and probable location. Note also that the tester's EKA is James M Cooley, born in Indiana in 1830. The immigrant ancestor might have arrived much later than did Benjamin.